Today is an amazingly powerful day. Karma is a natural law of the Universe. It is the law of cause and effect. With understanding, we can realize the life-affirming actions that bring benefit and happiness to all beings, as well as negative actions which bring suffering. With correct view, we are able to cultivate true wisdom. Some people misunderstand the concept of karma. that there is nothing that the individual can do. that future events are within your own hands. whether or not you engage in action. 1. Karma in Sanskrit literally means ACTION. 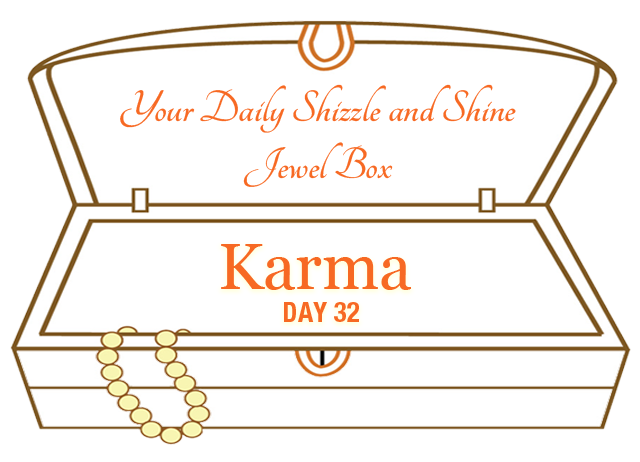 This refers to intentional physical, verbal or mental actions Karma is directly related to our intention or motivation. As it is written in the Bible Galatians 6:7-9, "We reap what we sow." Our actions, whether they are positive or negative, virtuous or non virtuous, leave imprints or seeds in our minds, and these imprints ripen into our life experiences when the appropriate conditions come together. The seeds of our actions continue with us and our lives are a seamless continuum. Our karma follows us everywhere. The largest obstacle to understanding or even believing in karma may be the factor of time. Most often, the results of our actions show up after a delay of time. And we can not discern which action caused which result. We come to realize that we are only looking at a very small period of time in this one life. The following contemplations were offered by the Buddha in the Upajjhatthana Sutta: "I am the owner of my actions, heir to my actions, born from my actions, related through my actions and have my actions as my judge. Whatever I do, for good or for evil, that I will inherit." Results are similar to the cause. Karma and its results are certain and unfailing. Positive actions of body, speech and mind will always bring the positive result of some form of happiness and benefit. Negative actions of body, speech and mind will always bring the negative result of some form of suffering. Karma and its results are exactly like a seed and its fruit. No results come without a cause. Actions not engaged, will not bring results. If the cause has not been created, the effect will not be experienced. Once an action is done, the result is never lost. An action done, is not lost and will ripen and bring a result. Karma expands. Once we have an imprint of an action in our mind, it tends to be habit-forming. Power of the Object : Practice remembering and thinking of all sentient beings that you may have hurt. In Buddhist tradition, remember and generate compassion for all sentient beings and seek comfort in the Buddha (aka Teachers), the Dharma (the word of Universal wisdom and truth) and the Sangha (the community of support that surrounds you). Consider one or two very painful situations that keep your heart from moving forward. Power of Regret : Upon recollection, you realize what happened and admit your responsibility for the wrong or negativity. You regret having committed the action and you feel this regret in your heart. This regret is not guilt, or meant for self-flagellation or criticism, but is intended for self examination and self honesty. With the power of regret, you feel deep remorse for past negative actions and recognize that the actions done in the past were unwise and hurtful. When you face the mirror, you can see your part and practice acceptance and ask for a shift. Power of Promise or Remedy : And so, now that you know, contemplate the very point where things "went wrong" from the Power of the Object and the Power of Regret. At that very point where you made the negative choice, apply virtuous actions and visualize in your mind a better, more positive, result. Power of Practice : By practicing morality and personal integrity, you can transform your karma and life experiences. By cultivating positive, virtuous thoughts, feelings, words and actions, exercising compassion, loving-kindness, and wisdom in daily life, karma can be transformed. Dedicate your positive action with a good motivation for kindness and compassion and the greatest good for all. P.S. 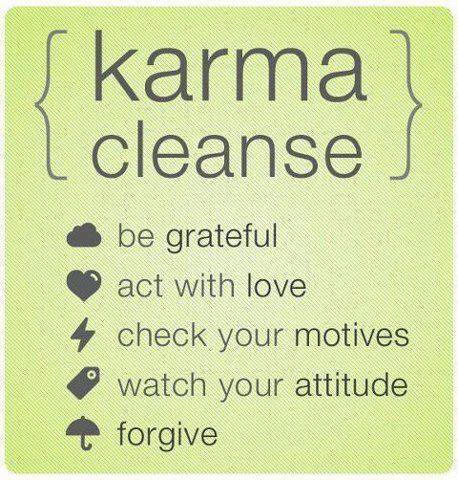 Karma cleanse in every moment and be accountable for your thoughts, words and deeds.